Kayla Ford from East Hamilton High School, seated between Chattanooga State assistant coach Robin Jacks Moore and head coach Janet Tate, has signed to play volleyball at Chattanooga State Community College for 2019-2020. 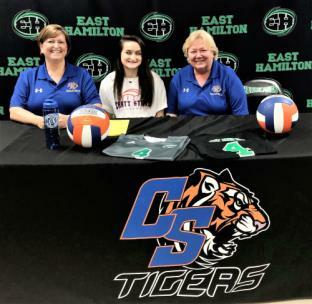 While playing volleyball at East Hamilton, Kayla was selected to the 2018 All District Team; her team was District Champs in 2017 & 2018, Ooltewah High School Tournament Champs In 2018, 5th place in State Tournament in 2017, and 3rd place in State Tournament in 2018. She has played Club Volleyball for C-4 for 4 years where they have been K2 Tournament Champs 2018, 2nd Place at Region Tournament 2018, and West Icebreaker Tournament Champions 2019. Also, she has been a high school track member 2017-2019, Captain of the track team, 2019, placed 3rd place in 4x4 relay sectionals, and 1st place in the Georgia vs Tennessee track meet. Academically, Kayla has been a member of the Peer Ambassadors Club, Young-Life Member, Diamond Doll Member, Awarded the French Award 2017, and Weight Training Award 2018.